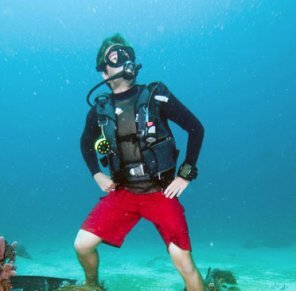 In 2011 Greg graduated from Florida Atlantic University with a degree in Hospitality Management and just like we had been telling him The Scuba Club would be a perfect place to practice his degree. Greg grew up in Pennsylvania doing all of the normal kid stuff, soccer, high school and then his parents moved to Florida. The Florida lifestyle fit his personality perfect. FAU fit his education needs perfectly also. And then he took a SCUBA course at The Scuba Club and got hooked. After diving through the summer he realized that just a little diving was not enough. May of 2009 Greg started part time at The Scuba Club and it has been dive, dive, dive ever since. Interesting how all of us guys have slipped into a career that is fun and rewarding and one where we love to show up to work whenever needed. Greg is so into it that he has progrerssed from Open Water diver to Instructor. Greg is now pursuing his "lifelong dream" to become an insurance agent but still helps us out on weekends when he's needed.